The Second World War, which Britain and her empire fought from 1939 until 1945, offered up to history the enduring founding myths of the post-imperial period. The Blitz; the Battle of Britain; Dunkirk; VE Day: the conflict’s major commemorative events were all the result of military and material challenges, overcome by leader, soldier and ordinary housewife alike. 'Ministry of Food', the exhibition opening on 12th February at London’s Imperial War Museum, deals with one of the most unsung but vitally relevant of these heroic victories: the revolution in culinary and dietary habits forced upon Britain by shortages in the island’s staple foodstuffs. From food rationing, to the donation of tin pots for military hardware, an entertaining exhibition tells how the Second World War was experienced in the most immediate sense by ordinary people. At the war’s outbreak, the shipping of colonial imports such as Canadian wheat and Caribbean coffee, sugar and bananas came to a swift end. 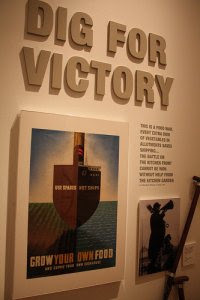 As this reality set in, the government attempted to quell public fears and raise morale through co-ordinated propaganda campaigns - the ‘Dig for Victory’ poster being one of the most well-known. Outcomes were many and various. Mountains of food waste were saved. A wholesale conversion from cattle to arable farming came about. Alternative and ingenious methods of feeding hungry families were developed, often spontaneously, and on a local level. The domestic production of potatoes, oats, orchard fruits and root vegetables was encouraged. Recipes accordingly took account of wartime shortages, with ingredients such as mock cream (sweetened, whipped margarine), mock goose (a mixture of potato, apple, cheese and sage), and potato biscuits (made with oats and mashed potato). Other surrogate staples were not so successful. Snoek, a cheap, pungent and hugely unpopular South African canned fish, made its inauspicious culinary debut. American imports such as Spam fritters, Wrigley’s chewing gum and Kellogg’s breakfast cereals had been available prior to 1939. However, the only successful 20th-century invasion of Britain - that of GIs - permanently popularised these dubious additions to the food arena. 'Ministry of Food' is not limited, however, to the compact first floor exhibition space. The Imperial War Museum’s café has been transformed, by Company of Cooks, into ‘Kitchen Front’ for the duration of the show. The menu reflects the realities of wartime diets. This is no bad thing, as the menu would feel more at home in a gourmet South Bank restaurant, than lifted from the pages of a rationing book. Alongside the obligatory mock cream and potato biscuits, sit delicious baked potatoes with Stilton and walnuts, marinated herring with red cabbage and miniature vegetable pies. It is illuminating to query the motivations behind the Imperial War Museum’s choice of exhibit. A clue arrives with the opinions of TV gardener and environmentalist Monty Don, invited to speak at the exhibition launch of how the Second World War helped to redraw society’s attitudes to food sources. By 1943, six million British families grew their own vegetables. Urban pig-rearing societies had a 100,000-strong membership. Allotment space doubled over the course of four years. For Don, these are not flat historical facts. For him, and the green movement as a whole, the story of food production and consumption in wartime Britain has helped to inspire their vision for a brave new world of sustainable eating habits. The historical parallels are difficult to ignore. Just as in 1939, Britain today relies as never before on cheap, imported food. In the same way as the merchant navy had to do battle with U-Boats, suppliers to UK supermarkets now have to fight rising fuel prices and volatile environmental factors. Reflecting these realities, any appraisal of recent government policy and media coverage will show a developing trend towards discussion of food policy and politics. 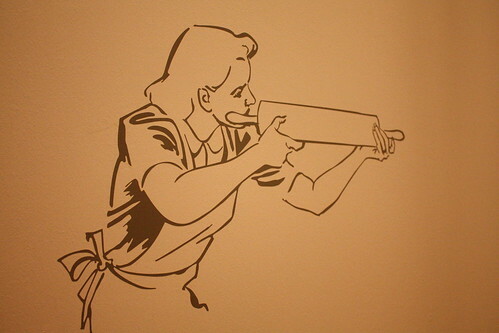 A pronounced nod to the green bandwagon underpins the Imperial War Museum’s new exhibition. 70 years ago, however, the changes in how the nation ate, shopped, farmed and gardened were relatively immediate. By contrast, gestures towards a greener way of life in contemporary Britain are gradual and, a cynic might say, rather superficial. The island is not currently blockaded by submarines. The capital’s soil is not being ploughed nightly by doodlebugs. The trend for more sustainable, ‘ethical’ foods remains just that: a trend. It both limits itself strictly to wealthier supermarket customers, and extends to such anomalies as air-freighted, but organic, tropical fruit. Factor in the embedded status of such post-war trends as fast food chains, TV dinners and intensively-farmed agriculture, and the green lobby sounds more like a minority voice in the debate over food. Monty Don, like it or not, is the poster child for a decidedly middle-class approach to food: one based on commoditised pleasure and the arbitrary concept of 'ethics', rather than enforced austerity. It may be stating the obvious, but the wartime populations of London, Manchester and Glasgow did not write to their MPs, demanding that their beloved banana shipments be torpedoed. A sad reality which the green movement must face is that tectonic social change does not tend to come about except through necessity. The message to learn from the Ministry of Food exhibition, and from history, is that until this country is forced to move away from its addiction to food convenience – be that, as in the past, through military aggression or environmental catastrophe - there is very little that can be done to change it. The exhibition, however, is excellent, and comes highly recommended. Thanks to Doreen J Barber for the images of the exhibition. Great exhibition, every should go visit. We were all healthier in times of scarcity!